You may remember my friend Melush (Melissa) from an interview a few weeks back. Well this time, I caught her in her nursing scrubs! Love how she is making a difference in her world by standing out in her profession. Who said you can’t work in a skirt?!?! Where there’s a will there is a way. Melissa tells me that she bought the uniform as pants and her lovely grandmother turned them into a skirt. She also says that she doesn’t find it difficult to run around in the skirt. For added modesty she will wear leggings under the skirt in case it rises as she runs to assist a convalescing patient. Cute eh?! 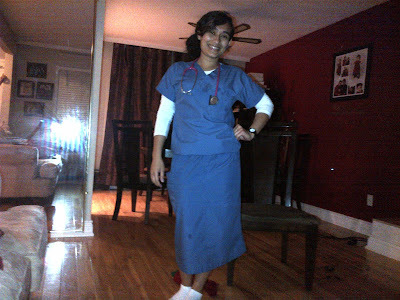 When i was in NC.. i use to work in a Pediatric clinic that required me to wear scrubs too. I work skirts too! there is various of website and catalogs that sell scrub skirts. WOW, just came across this post randomly. Your scrubs look awesome! I'm trying to figure out how long I want to make my scrub skirt. I'm still in school and am starting my clinical rotations this fall. How long in inches is the skirt? and I guess with that I also have to ask how tall are you? Mel says: Well I'm like 5'2 the skirt goes to my mid calf. Very creative. I wouldn't have thought of taking scrub pants and turning it into a skirt. It must be a lot cooler too in the summer. Cute idea! can you tell me where i can find a patteren to make the scrub skirtS? Beautiful! I also wear only nursing scrubs also !!! Thankyou for sharing ! Thanks for this nice and Helpful post. There is something moderately nice about the "Modest Nursing Scrubs ". I like the suggestion. I want to share some information about it. Hi! I am starting nursing school right now and I was actually thinking abiut giving in and getting scrub pants! But I thank God for allowing me to come across this blog site! I love the length of your scrub skirt and will have my mom make me one. I have wore a scrub skirt in the past but it was knee length and too short for my liking since we deal with a lot of bodily fluids. God is so just and faithful and he knew my worry so I thank you so much for this post!! And I know that if I take a stand for him he will take a stand for me! thanks again!! Love it, all things are possible with the Lord. Doing research for business in modest scrub apparel. You look wonderful! This is a link to beautiful full length scrub skirts. An interesting discussion is worth comment. I think that you should write more on this topic Scrubs Online Store. I'm a Muslim CNA and I'm so happy I stumbled on this blog! It feels great to know that there are many people out there that work hard to please God by dressing modestly. Thanks for the great idea! I'm gonna try this soon. In depth analysis of nursing uniforms can be an enriching experience. While it is becoming a hot topic for debate, it is yet to receive proper recognition for laying the foundations of democracy. It is an unfortunate consequence of our civilizations history that nursing scrubs is rarely given rational consideration by the aristocracy, who form the last great hope for our civilzation. Wonderful to see nurses serving the Lord in modest dress! We would love to have you visit our shop and check out the modest scrub skirts in our store, www.gatheringofgoods.com! I started nursing school and had to pre-order a scrub skirt from the uniform store. Glad to see this. Yeah I completely agree that these days modest womens scrub pants gives great look. I also love wearing stylish and trendy scrubs to stand out among my all hospital staff. Well now I will try wearing leggings under the skirt for more modest look, thanks for great idea. I recently got accepted to Nursing school and being a veiled woman it is far from being easy to remain modest at all times BUT worth it and DOABLE. Nothing is comparable to the satisfaction of God. ! FYI Cherokee makes scrub skirts and sells them for under $20. You can find them on amazon or ebay!